We were strolling around Galilee RI one cold winter afternoon,and this lobster boat coming in captured me with its name. On the way back we saw it parked, and the painting was there with the fishnets and all. I just had to paint it. I thought it was the best painting in my last show. 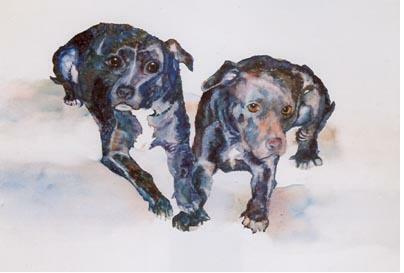 Thes two pitbulls took second prize at the Plymouth Guild Annual art Show. 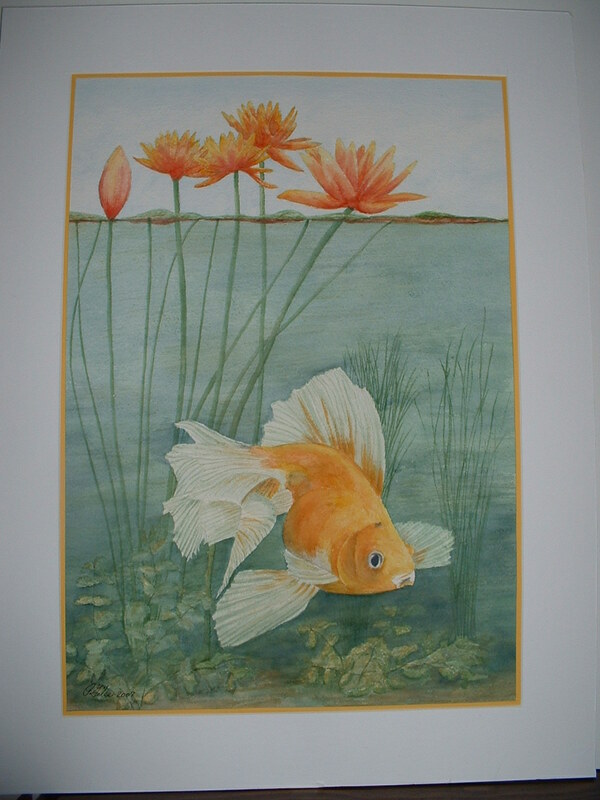 Just one of my favorites as I like to paint goldfish; do not know if I have a "best". Would appreciate your comments on painting. I wanted to paint a botanical style watercolor flower. I was happy with the final results and even enjoyed doing the calligraphy of its latin name. 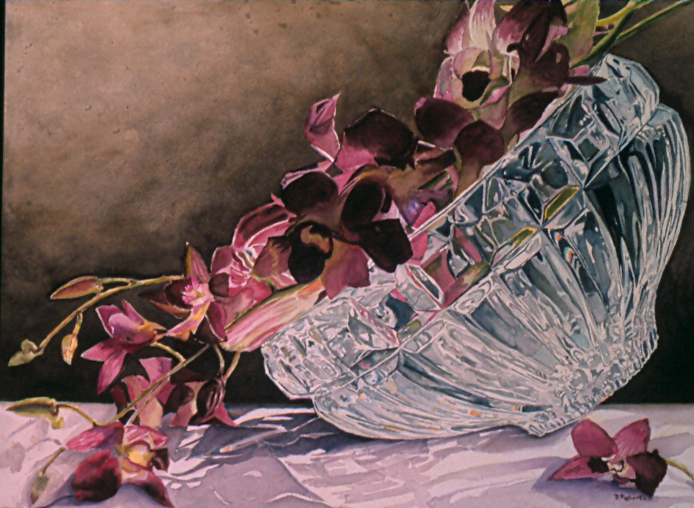 In this painting, I achieved what I was looking for, a loose interpretative version of my still life set-up. Finally! Not so easy to get back to that place, I don't know why. 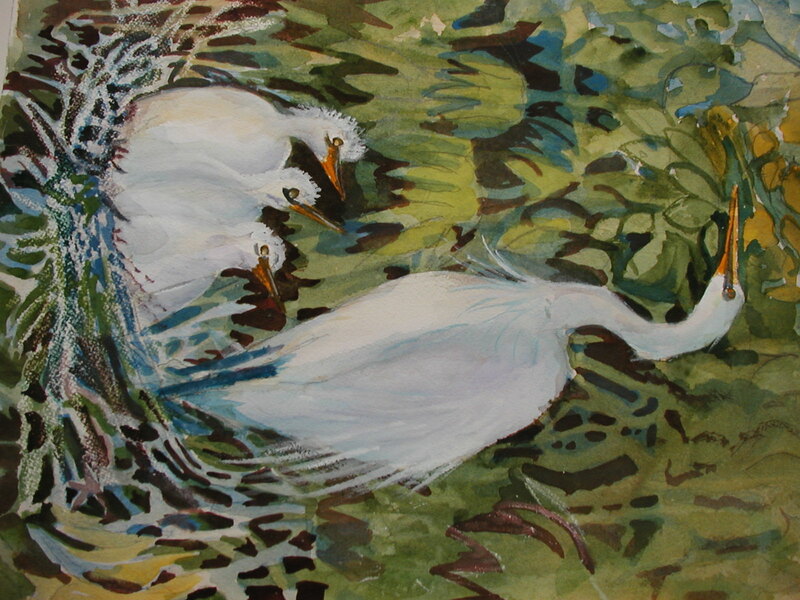 This painting represents a breakthrough in my painting process a long time ago. I was challenged to paint "poetic realism," instead of WYSIWYG. 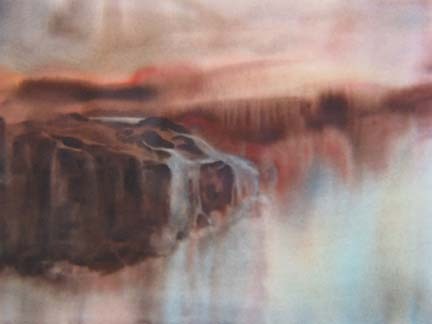 I painted on fully saturated paper with a 2" hake brush, using brown madder alizarin, raw sienna, indigo, and warm sepia. (I never use sepia now.) At the time, it was my "best ever," and is still one of my favorites, wherever it may be now. Harborside "The Narrows". St. John's, Newfoundland, Canada These are the ruins of the wind and sea ravished fishing shacks ("The Rooms") that once housed the bustling 400+ year old, now over-fished, Cod industry. The winds of a tropical storm howling through these ruins sounded like voices crying. My tribute to the souls who walked there before me. 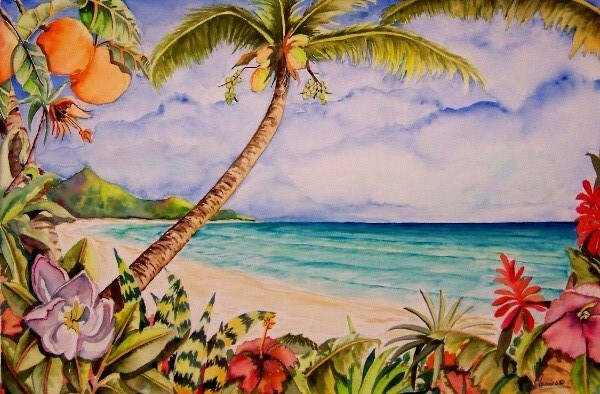 A typical "Caribbean" theme land/seascape. 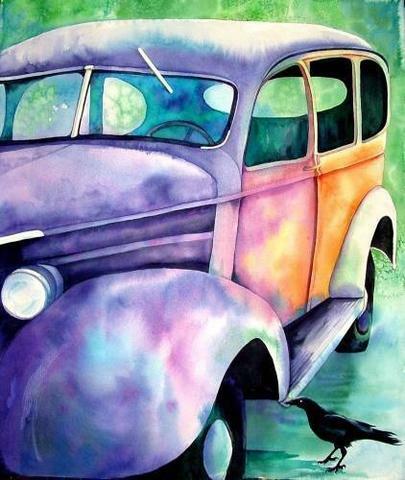 The painting of this 1938 Chevy Suburban was created with a fluid acrylic poured background and subject and detailing were painted with transparent watercolors on top. 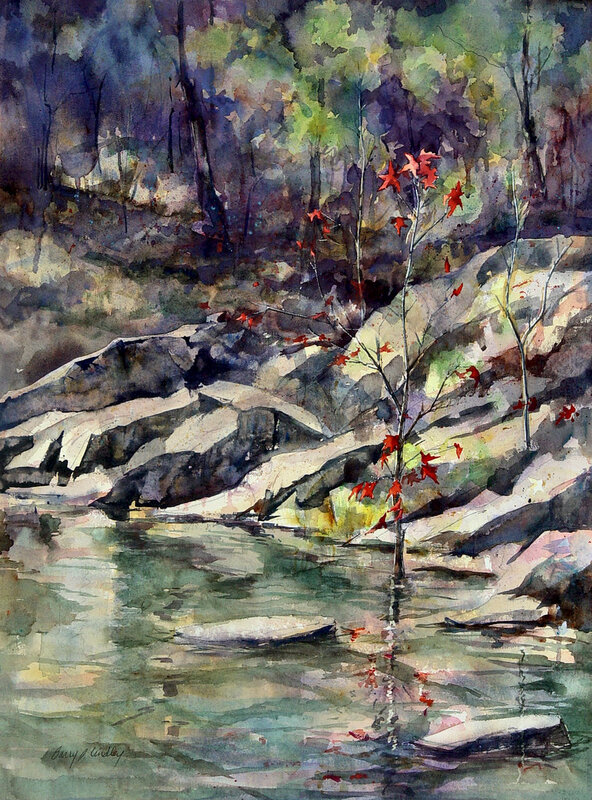 "Sweetgum at Pinnacle Quarry Pond, Autumn"
This started as a class demo to show my students how to make paint flow with the help of water and gravity... Turned out to be one of my finest happy accidents. One of my favorites because I spent this morning fishing with my son at Watch Hill. 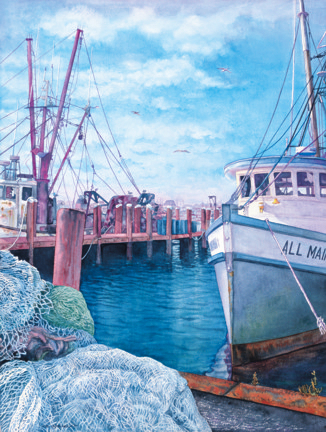 It won several awards and he owns the painting now. 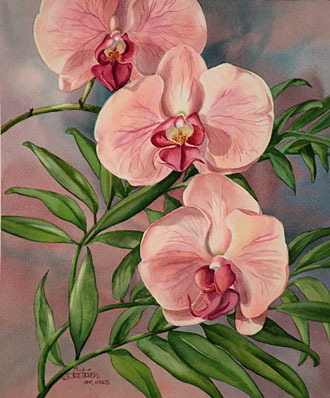 "Orchidée et Palmetto / Orchid and Palmetto "
Watercolour on Arches 140 lb c.p. 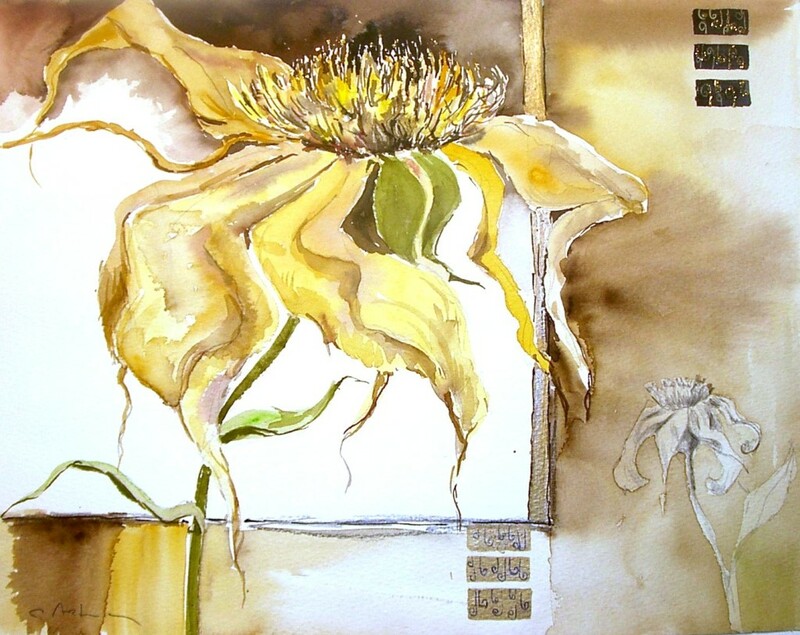 Everything went very well while I was doing that painting: choice of flowers, composition and drawing, background. 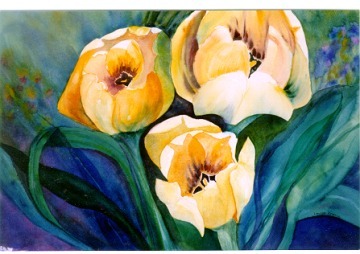 Mant visitors in exhibitions told me that this painting is a real celebration about flowers. This is from a photograph of a friend. I liked the relaxed feeling against the New Mexico colors. 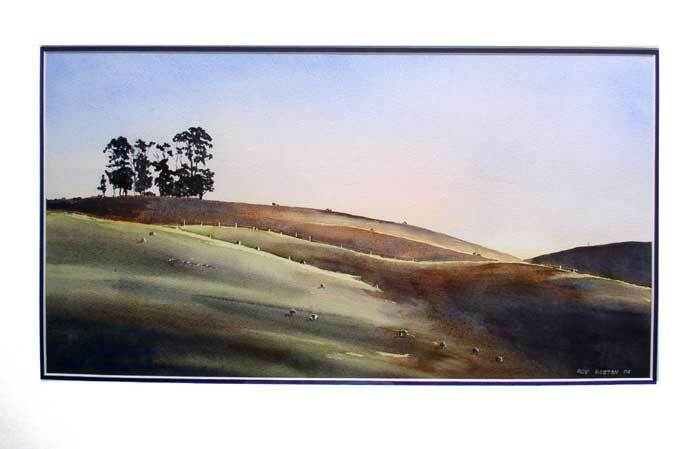 The photo of the painting is a little dark but not having tried before I thought I'd like to submit it anyway. 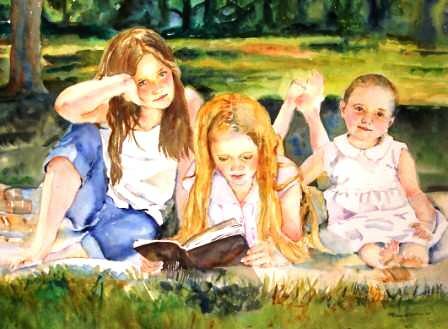 This is one of my favorite paintings. 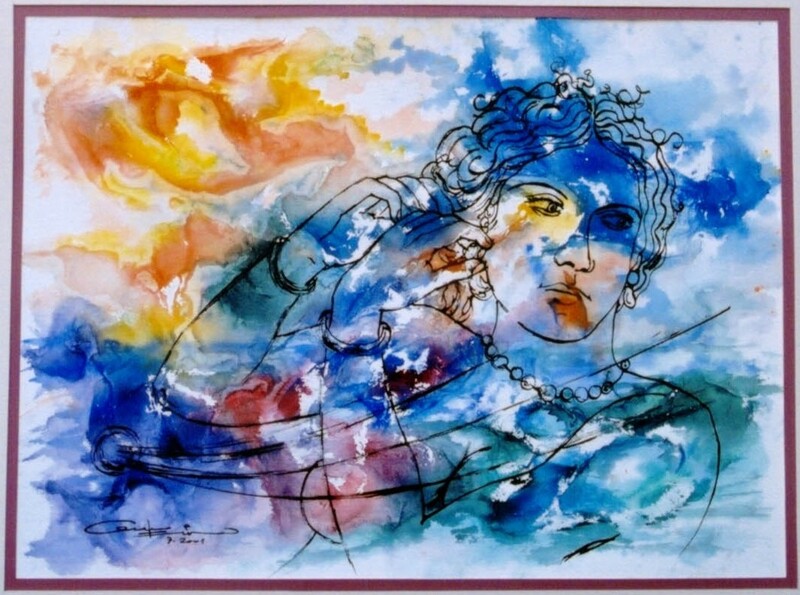 The reason I like this painting is because I only used three different colors, but as they mingled and merged on the paper it gives the illusion of many more colors. I also like the textures created because of how I applied the gesso to the paper before painting. 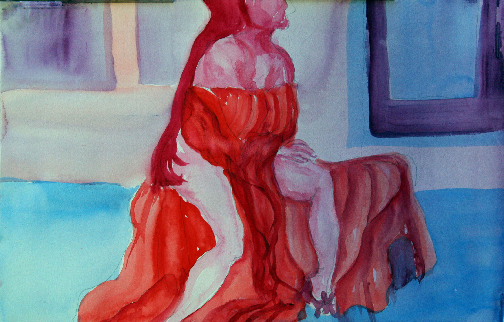 ""Sophia,(Wisdom), is making hershelf up""
A semiabstrac aquarelle from my serrie "Women's Moments".In our age. technology and knowledge is very very high, but not the same with the wisdom; it is missed. So, wisdom is just making hershelf up. 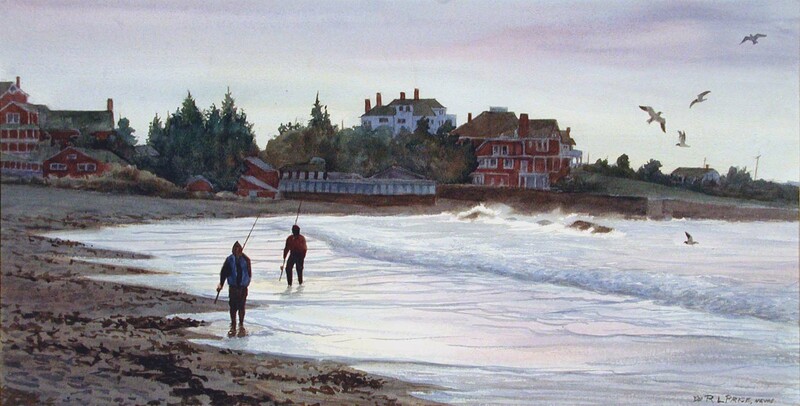 "Point in Time - Tracadie"
This watercolour was painted as an attempt to capture and savor a particular moment in time. Early in the summer upon my arrival on Prince Edward Island, I headed directly to Tracadie Beach along the northern coast despite overcast skies and a chilling, raw headwind. As my companion and I made our way through the windblown grasses, sand dunes and black, gnarled trees, the force of the nature was overwhelming. Although the roar of the ocean hung in the salty air over the dunes, I had not yet made a sighting of the water. 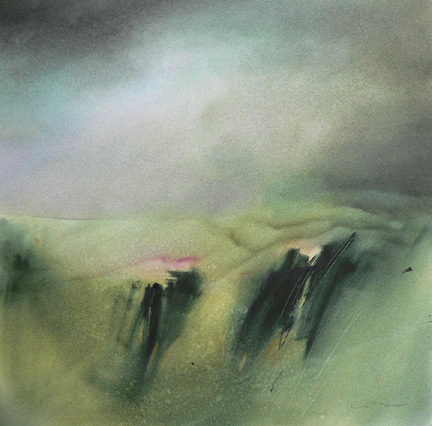 This painting reflects on that instant of suspended anticipation of the power that lies just beyond the last ridge. I was honoured to have this painting selected by the Canadian Society of Painters in Watercolour for the AJ Casson Medal - top award in 2008. 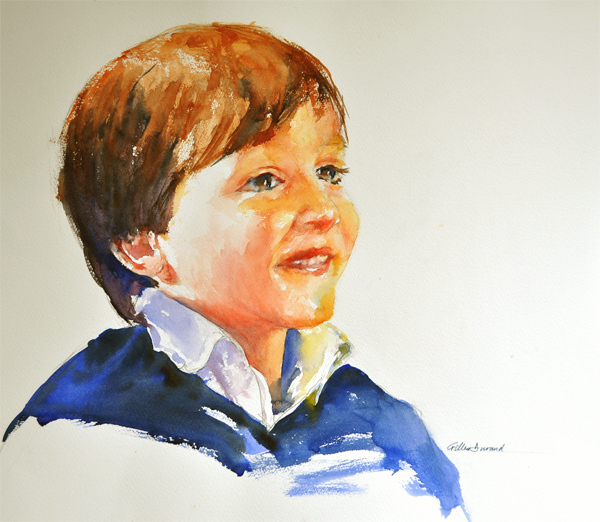 I painted this portrait of my grandson Victor last week, and it is intended as a gift for my son's birthday next friday. This is certainly my most emotional experience of late as a painter. Title refers to dominance. 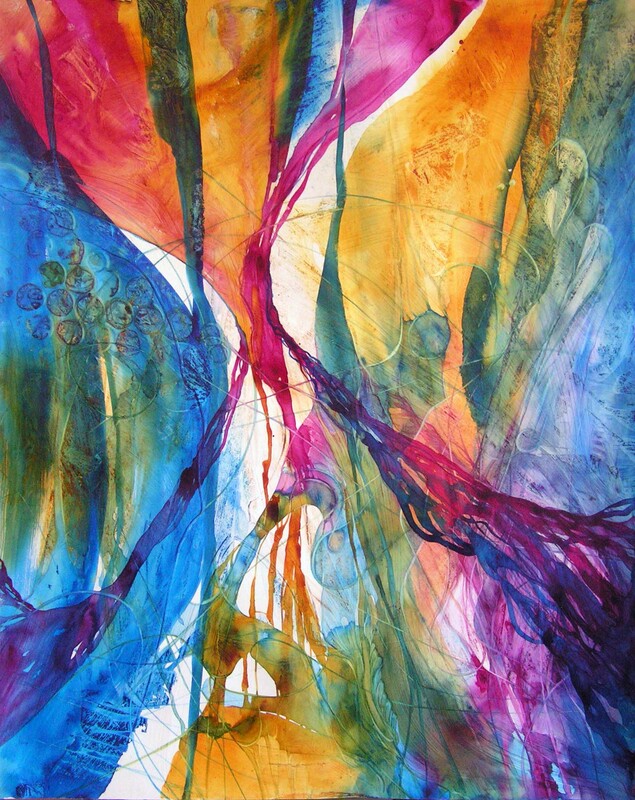 Started with water drips into which complimentary colors are dropped and fused by shaking and moving paper. I will never sell this as it won many prizes and got me accepted as signature member of PWS. I wanted to learn how to paint large flowers. 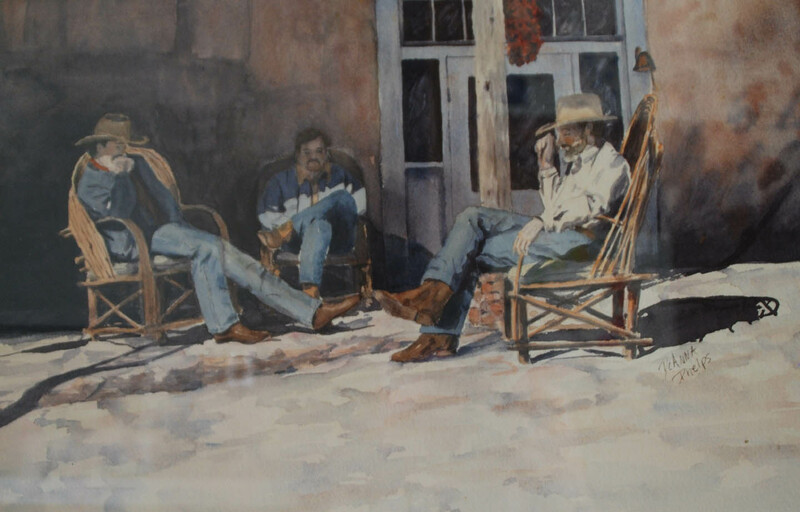 It was started in a workshop with Ann Pember and finished probably a year later when my courage and skill had developed more since I was fairly new at painting. Still amazed at how well it came out, she humbly said. 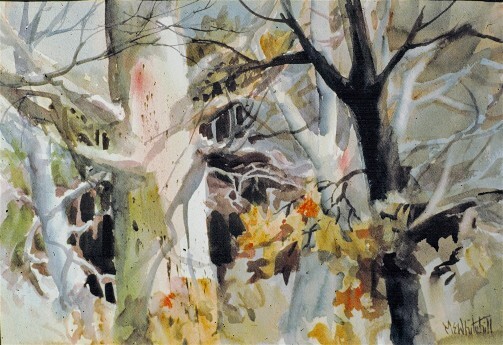 The small photo is the still-life sketch on which the painting is based. 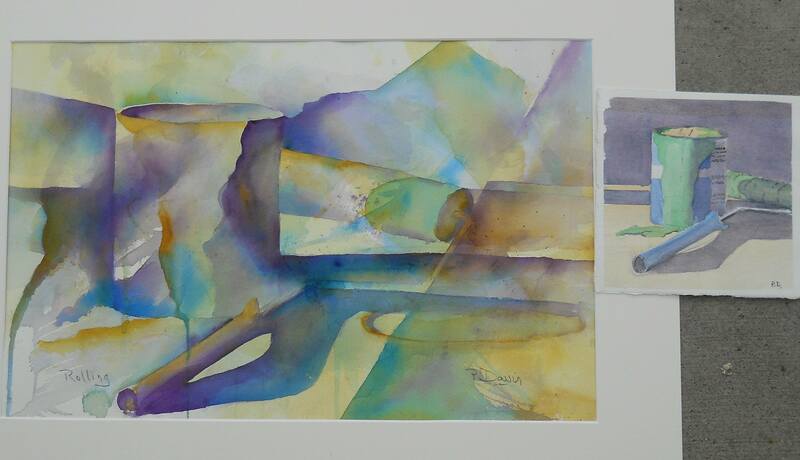 Our instructor, Sharon Williams, had asked us to do a larger version using a limitted palette (Quino gold, Phthalo blue and Dio purple were my choices) and to link lights and darks. Frankly, this is better than ever I thought I could do. I am ecstatic with the result.